I’m thrilled to feature my friend, author Susan Bernhardt on my blog today. Welcome Susan. 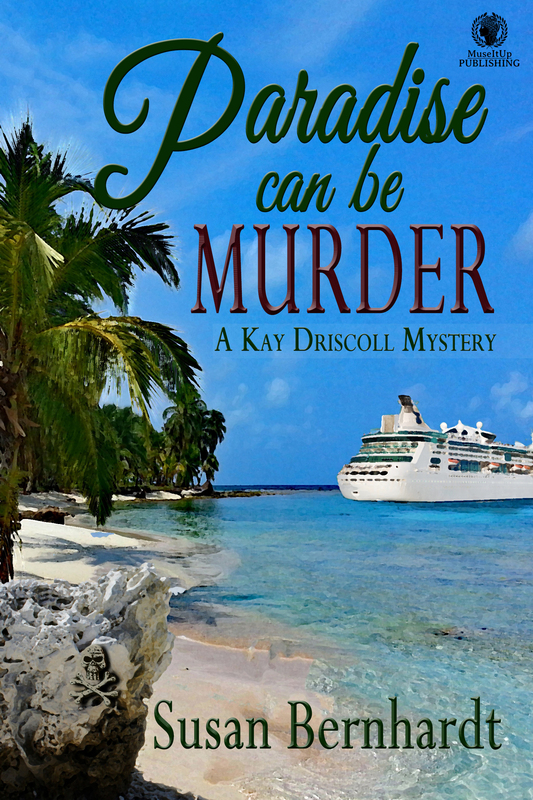 Your fourth book in the Kay Driscoll series is out, Paradise Can be Murder. This is quite an accomplishment. Not only have you written this book, but between your third and fourth, you managed to write another book. How do you feel about all this success? I write because I enjoy writing. Writing for me is all about having fun and entertaining others. I have readers who follow my books and are excited by them and that makes me incredibly happy and satisfied. I’ve preordered Paradise Can be Murder but have not read it yet. As soon as it arrives, I plan to hunker down and read it. What do you think I will find unique about this book? In other words, what makes it stand out from the others you’ve written. You know I’m a big fan of the series. This book deals not only with thrilling mysteries but also with racism and intolerance. This is a problem in our country and I thought I would address it in my story. I don’t know of any other cozy mystery that deals with racism. There may be some out there, but I’ve never seen any advertised. This book takes place during a cruise Kay and her friends take. You and you husband have gone on several cruises. In fact, you recently went on another one. How much of your own experiences with cruises made it into this book? The cruise part of Paradise Can Be takes place in the Caribbean. I did research on three cruises for this mystery. Definitely some of my own experiences are in this book such as the excursions, activities on board, doing a reality check on some of Kay’s “stunts”. Lol! I’ve taken tours offered by the ships and have questioned the ship’s personnel regarding murder and mayhem: where they would store a body, hold a murder suspect, etc. I experienced some of the things Kay Driscoll experienced. You’re a very prolific writer. To what do you attribute your success? You have a busy family life, particularly with an adorable grandson with whom you visit often. Do you keep to a strict writing schedule and plan everything else around it? I plan my writing around social activities and family. Not the other way around. I don’t have a strict writing schedule. Before my husband retired, I’d write part of most days during the week. After he retired, I went to writing two days a week, but they were full days and I felt more productive. The cover for this book is eye-catching. What was your experience with the designer like? I sent an in-depth form to my cover artist of what I wanted on the cover and what I didn’t want. I also sent her three photos of what I wanted on the cover: the white sand, the cruise ship, palm trees, rocks on the beach, the skull and crossbones. She did everything I asked and I think the cover turned out great. I only asked for one change from the first cover she originally sent. This was the easiest time I ever had with a cover artist. I recently participated in a panel about writing books and the main topic was whether to outline your book first. What is your process for writing books? I know in a mystery, you have to know the crime, the victim and the “villain” before you do anything else, so you know what clues and red herrings to sprinkle throughout the book. Once you plan all that out, do you outline the book chapter by chapter, or do you let your muse take you where it wants to go without veering too far from the original concept? I don’t outline. Before beginning I usually know the crime, but not all of them since I often have multiple murders and murder attempts. Sometimes more victims appear in the book than I originally planned. I’ve even added murderers to a crime. During the first draft, I write anything and everything that I can think of pertaining to the story, my raw thoughts. I know there will be several revisions. The story develops as I write. If I veer far from the original concept, that’s fine with me. It veers because I’ve come up with additional ideas to make it even more exciting and complex. I like complexity. What is the one word that would describe your feelings about seeing this book published? Are you planning another Kay Driscoll book? She’s become a sympathetic character loved by your readers. I’m sure they want to hear more from her. I have started the fifth Kay Driscoll mystery. I’ll continue to take notes as I think of new ideas, but I’m taking the rest of the year off to prepare and spend the holidays with family and friends. I will continue to do promotions during this time. In January I’ll resume work again on the book. I know that writers are always writing, in the shower, in their sleep, at dinnertime. There’s always something brewing in their minds, either a new idea or something they’re working on. How do you manage to turn your writing brain off and relax? In other words, what’s your secret for keeping your sanity while under the pressure of delivering a book? When I’m in writing mode, I don’t turn my “writing brain”off. I’m always thinking of my book in the back of my mind. Ideas keep popping up and I’ll write them down. For me that is one of the fun things about writing. Thinking about my book, coming up with new ideas and scenarios. As I mentioned above I’m not writing the rest of the year, so I don’t have this happening now. I’m presently relaxing. I just came back from a trip to Eastern Europe. I enjoy visiting art museums, going out with friends, decorating for the holidays, being with family, etc. Thank you, Susan for visiting us today. I wish you the best of luck with this book. Thank you, Lorenzo for your thoughtful questions. I enjoyed thinking about and responding to them. Meanwhile, a racially charged hate crime back home shakes the community of Sudbury Falls. Tagged Cozy, cruise, Kay Driscoll, Lorenzo martinez, mystery. Thank you, Lorenzo for your thought-provoking questions and your kind invitation to be interviewed. Congratulations for being on the 2017’s list of Top Ten New Latino Authors to Watch (and Read). Susan, thank you for doing the interview. I wish you great success with this book. I enjoyed reading this in-depth interview. Paradise Can Be Murder sounds like a great mystery. Thank you for stopping by. This is indeed a great mystery. Thank you, Bill for your kind comment and for stopping by. I hope you’ll read Paradise Can Be Murder. Previous Post The Fear Factor: to act or not to act.